Katia Detty (24) defends for Washington against Wilmington in a non-conference match played at Washington High School Saturday, Aug. 25, 2018. 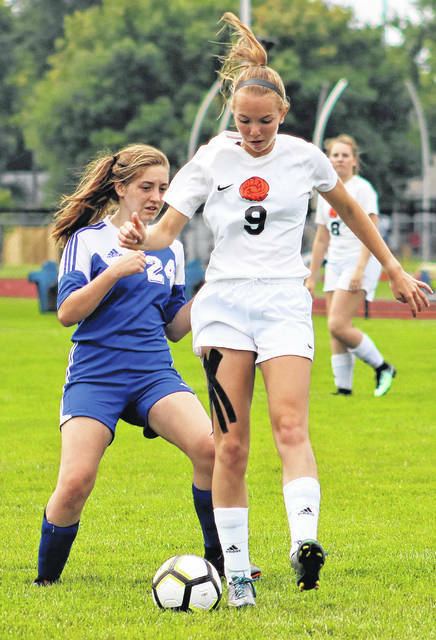 The Washington Lady Lion soccer team hosted former SCOL rivals Wilmington Saturday, Aug. 25. The Hurricane won the match, 4-0. Wilmington held a 2-0 halftime lead. “Our young defense took a big step in the right direction,” Washington head coach Chris Chambers said. “Injuries have been part of the culture of this team, and we’re still battling to change that. Several girls played with significant injuries or illnesses, but we still played much better than we did in our first two outings. “Taylor Smith showed again how strong a goalkeeper she is,” Chambers said. “We improved on lessening the number of shots, especially the free and clear ones, on Taylor.